EASY TO USE. Thousands of students have used WINKS as software for a statistics course or as a tool for performing personal research. It is designed to lead you to select the proper statistical procedure to use, to help you perform the analysis, and to help you interpret the results. INDIVIDUAL STUDENT EDITIONS START AT ONLY $49.00! If you are a student at a degree granting school, you will qualify for a substantial discount on the WINKS program. FEATURE RICH. Perform standard statistical calculations such as descriptive statistics (means, standard deviations, medians, etc. ), histograms, box plots, t-tests, correlation, chi-square, regression, analysis of variance (ANOVA), probability, non-parametric statistics, graphs, survival analysis, time series, Chi-Square, reads and writes Excel files and more. WINKS allows you to easily enter data, perform statistical analyses, and get your answers quickly. It is easy to learn and use -- many of our users tell us that they can get answers quicker with WINKS than with other programs. It simplifies data entry, leads you through an analysis without a lot of complex options, and helps you interpret your results. 1. 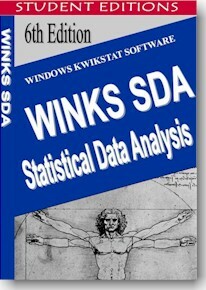 For students new to statistics in an introductory statistics course we recommend the WINKS BASIC EDITION. 2. For graduate students performing statistics for projects, theses or dissertations, we recommend the WINKS PROFESSIONAL EDITION. 3. Optionally order the AGAINST ALL ODDS VIDEO, which is a great video tutorial in the fundamentals of statistical data analysis -- at a $10 discount. FOR MORE INFORMATION -- For a detailed description of WINKS BASIC and PROFESSIONAL click here. 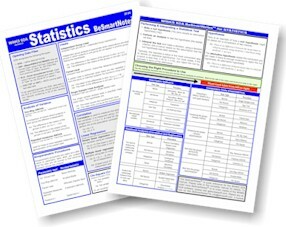 Plus, checkout the WINKS SDA laminated 8.5 x 11" 3-hole punched "BeSmartNotes" notes -- very helpful!